Various parts of the project. Power source of the movement. Test fitting the frame, minus the rods, tubes and bearings. LOVE it! Where’s the hour hand? Did you have to scale it or is it full size? It is full size. 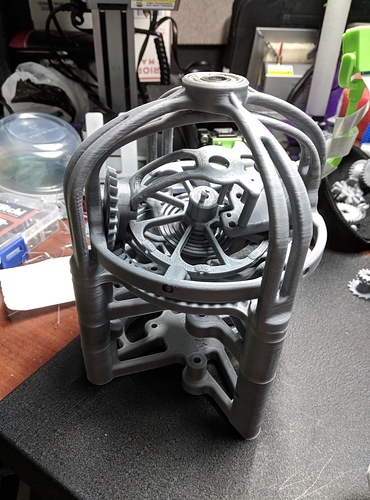 You have to print it full size or else the bearings, rods and pipes will not fit. This is the biggest piece. This is VERY cool, thank you for sharing. I think that will be my July project. Get my kids into some mechanics. Congratulations! 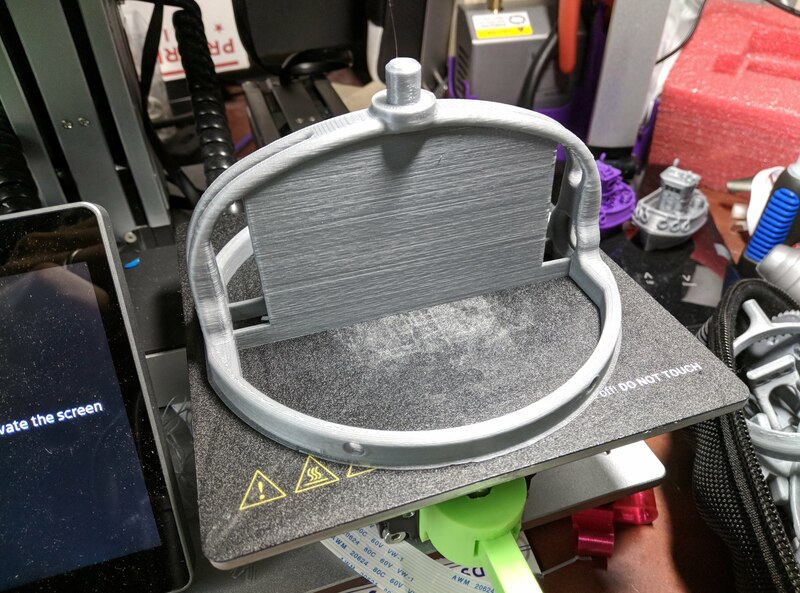 what slicer did you use, and what were the print settings if you dont mind me asking. I used a mix of Cura and Simplify3D. For this one I printed with a layer height of 0.2mm. 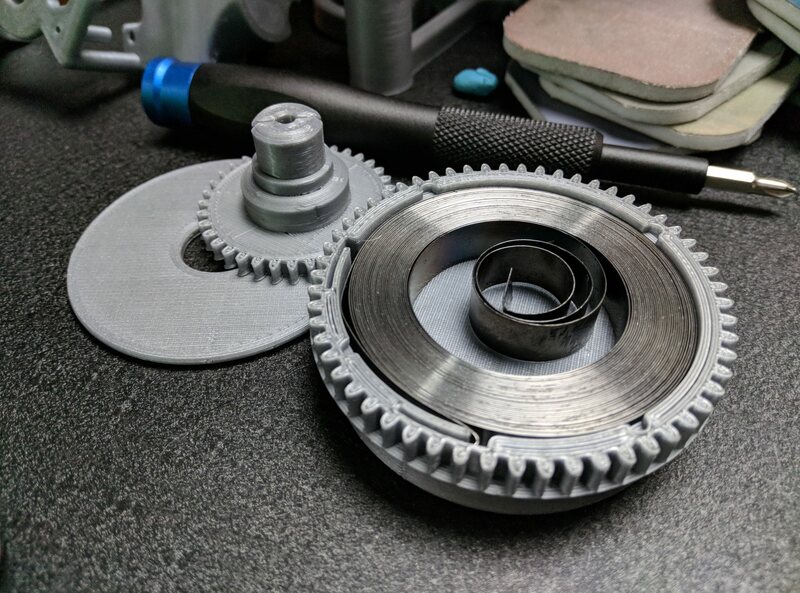 Infill varies between 30-70%, depending on if it is going to have a lot of load, eg the gears have higher infill compared to the frame pieces. I used PLA at 200C, but that is what works for the Inland brand I use. Sorry I couldn’t be more specific because I was testing out various parameters as I went. I’m making another one for my dad. 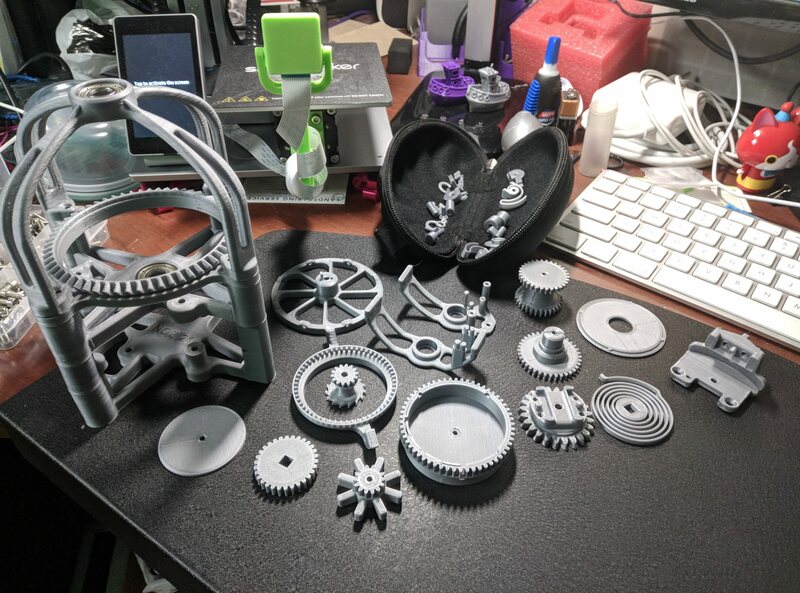 I plan to use a mix of PLA and PETG (for the gears) filaments of 2 or 3 colours. 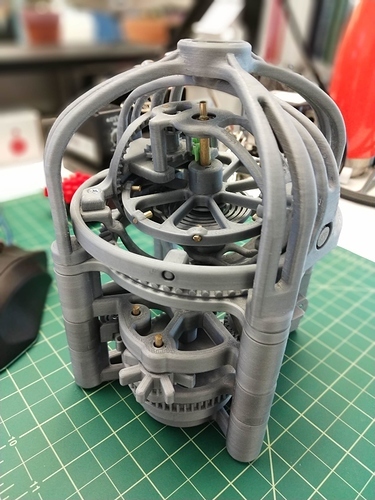 It will be printed at 0.1mm layer height. So yeah, I’ll be experimenting as I go. Where did you get the spring from? Found the spring on AliExpress here. It fits the description from the summary. @Tone are you considering making one? Yup. Already have about 1/3 of the parts printed. I’m trying to print them in contrasting colors. The main structure I’ve printed in the white marble color. The gears in silver and bronze. Still need to decide on colors for some of the the small parts. How long will it run with a full wind? The longest I’ve had mine run without sticking is almost a minute. It will run again for a while if I nudge it. I’m still making adjustments to reduce as much friction as possible. Where’s the cause of sticking? Did you have any problems with the première_cage_2_-_mod file. Seems to me it’s not laying flat. I think a lot of it has to do with the gear axles where it meets the frames and the whole assembly under tension because of the spring. Now that you mention it, yes. What I did was use “première_cage_2_-mod-_SP” file instead and generated my own support in Simplify3D.